→What are the Real Side Effects of Laser Hair Removal? Laser hair removal is one of the most popular long-term methods of getting rid of body hair, and laser clinics have sprung up around the country. However, while it may be one of the best methods for more long-lasting results, there are a few downsides to laser hair removal. Not only is it one of the costliest options, but there are quite a few potential side effects to be aware of. Itching - The laser light is meant to burn off all the pigment cells in your hairs, but it can also damage the cells of your skin. If the light stimulates your skin cells too much, they may be damaged. In many cases, itching is a side effect of your skin making microscopic repairs to the damaged cells. Redness/Swelling - There are four cardinal signs of injury, and redness and swelling are two of the four signs. If your skin is damaged by the powerful laser light, your skin will redden as blood rushes to the damaged area to make repairs. Swelling is your body's natural protection against further injury, as swelling is the result of excess fluid being infused into the damaged tissue. The redness and swelling may be minor, but you'll often feel tenderness of your skin accompanying the other two signs of skin damage. These two side effects are common after undergoing laser hair removal, but the good news is that they should fade within two or three days. The damage done to your skin will likely be fairly minor, and your body can repair the damage quickly. Hypopigmentation - When the laser light is beamed at your skin, it is meant to penetrate the skin and burn away the pigment cells of the hairs in your follicles. However, it's very likely that improper application of the laser will also burn away the pigment cells in your skin. You will end up losing the color on your skin, leaving patches that are lighter than the rest of your body. Hyperpigmentation - What causes your skin to produce more pigment cells? Light! When the laser light is shined at your skin, your skin may detect that it doesn't have sufficient protection against the light. As a result, it will produce pigment cells, even going so far as to overproduce it in certain parts of your skin. You may end up with patches of darker skin thanks to your body's natural reaction to light. Burns - Lasers are very concentrated light sources, and incorrect application of the laser can lead to burns. They will usually be first-degree burn, meaning it's not too serious. It can be compared to a minor sunburn, and will usually heal within a few days. Acne Flare-Ups - When the laser beams is shined at your skin, it can often stimulate your body to produce more sebum--the oil that protects your skin from damage. An increase in sebum can increase your risk of pimples forming, and adding the dead skin and hair cells is a recipe for an acne-flare up. Scabs - Your body uses scabs to protect damaged skin, and the laser light can often do enough damage to your skin to cause scabs to form. They will be fairly minor scabs--similar to those produced by tattooing. Purpura - This is the fancy name for bruising or purpling beneath the skin. They are the result of damage being done to the small blood vessels near the surface of your skin, and are fairly common if the laser is incorrectly applied. The laser light can actually burst the blood vessels by heating up the blood cells passing through them, leading to purpura. Infections - Skin that has been damaged is much more susceptible to infections, and incorrectly applied laser beams can cause damage to your skin. Once the skin is damaged, it's easier for bacteria and germs to inhabit the swollen, burned tissue before the body has time to heal them. The skin infections may range from mild to serious. Discomfort from re-growing hair. If you've ever shaved your chest, you know how uncomfortable it can be to wear clothes as the hair is growing back. Very sensitive skin. For a few days after the hair removal session, you may find that your skin is very sensitive--easily affected by creams, lotions, and environmental damage. Skin prone to sunburn. The skin has already been exposed to a lot of light, and adding sunlight into the mix just increases the amount of damage done. Tingling or numb skin. If the nerve endings of the skin are damaged, they may be unable to send accurate feedback to your brain. 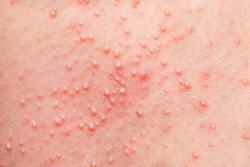 Allergic reaction to cream or gel. A numbing cream is often used before the treatment, and you may find that your skin reacts negatively to the cream. If you apply a pain-relieving gel after the session is done, you may also experience negative allergic reactions as well. "If the settings of the laser are incorrect, any of the following may occur: blistering, darkening of the skin, erosions on the lip, development of cold sores, redness, and persistent pain. Most of these are temporary and can be avoided by proper preparation of the treated area prior to the procedure being performed." "Other risks, although not common, include scarring, viral infections like herpes simplex , damaging a tattoo in the area, or in very rare cases even causing more hair to grow"
A recent study was carried out to monitor the side effects that patients experienced from a treatment of laser hair removal. As you can see from the chart, most people will experience redness (erythema) in the treatment area in the hour following a laser session. In some instances swelling can occur (edema). Other less common side effects include hyperpigmentation (darkening of the skin), crusting, hypopigmentation (lightening of the skin) and blistering. What precautions adverse effects in the laser? What follow best to remove hair on our skin?